A virus or malware infecting your PC? It is a very time-consuming, annoying as well as expensive experience to get rid of these malware from your computer system. The hijackers tend to take over your browser or even your computer. It can lead to loss of data, or worse identity theft leading financial scam. Malware is always looking for ways to take over your PC and lead to havoc in your life. If you follow some simple tips on preventing malware, you can stay protected and away from the eyes of a potential hijacker. The online world today is very dangerous. There are threats lurking at every click and you have to keep your PC safe from malware. The following tips on preventing malware will prevent you from visiting the hacker’s hell. Never download messages from any unknown sources. Do not click on links that say they can protect your PC from threats. You need an antivirus software from a legitimate website. Not a banner ad that claims to protect your PC. Do not fall for banner ads or pop-up ads that claim to win you a lottery or a price. They are scam sites that will trick you into downloading malware onto your browser or PC. Use a strong antivirus that helps you identify dangerous sites or links that can lead to malware. You can download a browser plugin called Web of Trust (WOT) that will help you recognize sites with a poor or questionable reputation. Keep the HTML turned off in email. Many times, malware is downloaded when you open a malicious email in HTML format. Thus, you will find many email clients and webmail clients ask you before displaying HTML content such as images. Open only those emails to open in HTML that are from your trusted source. Never download any attachment or documents that come to you in email. Scan them with the help of your antivirus installed. Many webmail clients scan the attachment for you before allowing you to open them. Never skip the scanning step before you hit the download button for your attachment. Many times scammers send you notifications from your bank, Facebook or Twitter. In reality, these mails are never from your bank, Facebook or Twitter account. Before you click on any link or fill in any account details in such mails, make sure they are from the legitimate source. Scammers trick you to click on the link and enter your personal details. Thus, ‘phishing’ your account password and other personal information. If you are in doubt, double check before you click any link. Never attach any USB stick from an unknown source to your PC. If you have to, make sure you scan it with an antivirus before you access its content. The person who offers you the USB may not even know a malware has entered their USB. Many antivirus software tend to scan automatically any USB stick that is attached to the computer. If not, then you can right click on the external drive and select Scan selected files with AntiVir. Be alert when you download any software. Many times, when you download a particular software, it comes along with freebies such as a toolbar or additional programs. Make sure you know what you are downloading along with the software you need. Opt for custom installation and unclick any additional software suggested by the program. Never install any software that you do not trust or have doubts about their legitimacy. 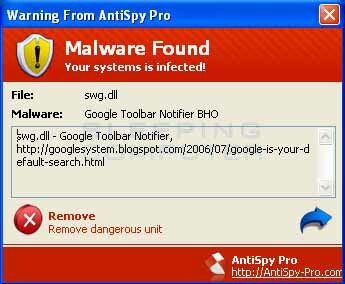 Install a good antivirus software along with a strong anti-malware or antispyware software. This will make sure your computer not stays safe from the attack of viruses, but also stays safe with real-time protection against Trojans, malware, spyware, adware, etc. Keep you software, system and applications updated at all times. These are a few tips on preventing malware. Stay alert; stay safe when online. Never leave your computer idle for long periods. You never know when a spyware or malware downloads itself and sits quietly hidden within your PC. They may be activated at a certain time and ruin your online experience.